Leadership is simply the ability to influence a person or a group of persons to move from where they are to where they ought to be: There is no leadership if there is no movement from point A to point B signifying progress. This also means that the said leader must have been where he is taking others or at least know the road to the destination. If your idea of leadership is to be served and not to serve, you will fall prey to the same menace obtainable in the leadership and government of most African nations. A servant mindset is very important for a leadership that seeks to move people from where they are to where they ought to be. At the end, both the leader and the follower must team up to make leadership effective but don’t be found wanting on your part as a leader. Everything rises and falls on leadership: You are where you are because of leadership or lack of it and so is your organization or anyone you know of. Results are determined by principles and processes but most importantly, principles and processes are managed by people who could be employees, leaders or both. There are no bad companies and firms, there are only bad leadership and we know this is true because a company can flourish under one administration and fall apart under another. The difference is leadership. When I see an organization doing well or doing badly, I am quick to refer to good or bad leadership because everything rises and falls on leadership. The blame shouldn’t be on the employee who tarnishes the image of a business but on the leadership who haven’t set and implemented rules that will curb such excesses. There is always something the leadership can do to make or mar an organization and indeed everything they do contributes to the rise or fall of an organization. No organization is ever more successful than its leadership: When a leader decides to remain at a spot in learning and growing, he isn’t just limiting himself but the entire organization. There is something about leadership and the progress of an organization and if leaders understand this, they will always seek to improve and enhance their knowledge through exposure, reading and association. A leadership that isn’t exposed to the right and modern way of solving problems will always create much stress and work where it can be eradicated or at least reduced to the minimum. Leadership is powerful because there are no leadership actions without impact, negative or positive. Anybody can become a leader in his or her area of discovered passion and talents when subjected to the necessary knowledge, exposure and practices. It gets interesting here because our world is fast losing its grip on the mindset of leadership obtainable only in the male camp. What are you passionate about, what are your discovered talents and gifts, give it attention, throw yourself into knowing all you can about what you are passionate about. Get necessary exposure through travelling, attending relevant courses, seminars and trainings and most importantly, practice all you’ve been learning, put it to work, go out and touch lives with it. Your leadership is birthed when you discover what your passion is and it is manifested when you both learn more about it and dare to take its execution personally. Leadership is a seed in all of God’s creation. It is a potential that must be tapped into if life must be meaningful. The fact that you are a human being male or female created by God is proof that there is leadership ability inside you. God is a leader and so are His children because anyone born in his image has his DNA. Don’t let anyone make you feel you can’t lead because you can. Being equipped for it or not is a different case which can be rectified with an adequate supply of knowledge, exposure and practice. Leadership is possible. Leadership is in you. Nothing stops you from exploring its very depth as it concerns your passion and talents. 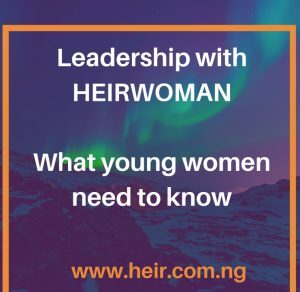 Your productivity is tied to your level of leadership effectiveness and like we will see in the next article on this, there will be no national transformation until we achieve personal transformation through personal leadership. You are a leader and your world depends on you to become better than it already is. KC EZE is the president and pioneer of The Shift Africa Youths Initiative, an NGO that teaches and empowers young people on leadership and personal development. He is a collaborative leader with strong communication and interpersonal skills built over his 11years experience in managing campus and youth ministry. He is also a co-pioneer of Champions Youth Foundation International which has been serving spiritual, leadership and life skills to young people in secondary and tertiary institutions since 2010. He is a dynamic TV host with ACNN (Anglican Cable Network of Nigeria) and a husband. This entry was posted in Advice, Continuous Development and tagged career, career advice, confidence, Employability Skills, leaders, leadership skills, transferable skills. Bookmark the permalink.